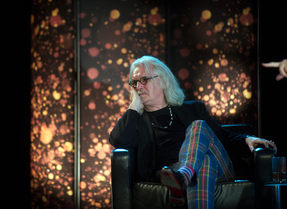 Billy Connolly discusses his career during a BAFTA interview in Scotland. 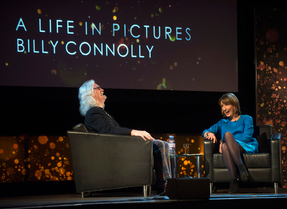 Scottish actor and comedian Billy Connolly discussed his career in A Life In Pictures Interview sponsored by Deutsche Bank, during which he was presented with the BAFTA in Scotland Outstanding Contribution Award. The interview was conducted by Francine Stock and held in Glasgow's stunning Old Fruitmarket. Connolly was his typically inimitable self, cracking jokes and sharing anecdotes with Francine Stock and the audience. Taking a look back at his long career in the film and television industries, he revisited some of his early roles and shed light on what went on behind the scenes. He recalled working alongside Richard Burton on Absolution, back in 1987. Connolly described himself to be in awe with Burton, managing to score some points with the great actor by showing him where to stash his cigarettes in his cassock costume. 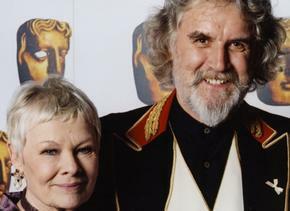 Starring with Dame Judi Dench in Mrs. Brown (1977) was a career highlight for Connolly; particularly because he convinced himself that Dench was flirting with him. He later realised that she was merely in character. He didn't shy away from praising his fellow actors and comedians, noting that the reason he was so disappointed to be beaten to the BAFTA for Actor in a Leading Role in 1997 by Ewan McGregor was because "when you get beaten by somebody you like, it’s worse." "Everything I did... I dreamt it, I wanted it and I went out and got it." Born and raised in the city of Glasgow, Billy Connolly left school aged 15 with two engineering qualifications (one collected by mistake) and didn’t immediately decide to pursue a career in the entertainment industry. Instead he worked as a delivery boy, baker, boilermaker, welder and for the Parachute Regiment of the Territorial Army before buying a banjo in 1966 and establishing himself as a singer on the folk music scene. Earning a reputation for his whimsical lyrics, he soon began to focus on the comedic side of his performances. Connolly found cult success through his stand-up and live comedy albums, but it was only after an infamous appearance on the BBC’s Parkinson in 1975 that his career really took off. 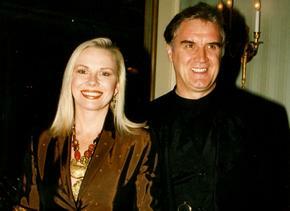 Shortly after Connolly began to receive his first film credits, and although initially they were mostly in concert films like The Secret Policeman’s Ball (1979), they went some way to introducing him to international audiences. His debut film performance was a substantial role alongside Richard Burton in Absolution (1978), and his supporting parts continued for some time in the likes of Bullshot (1983), Water (1985) and Indecent Proposal (1993). As his reputation as a stand-up comedian soared, Connolly continued to take occasional acting jobs and in the early ‘90s took over the lead role in the established US sitcom Head of the Class (1990-1991) as well as in its short-lived spin-off, Billy (1992). Not long after, Connolly was able to bring his comedy to a younger audience, providing a voice for Disney’s Pocahontas (1995) and then in a small but scene-stealing role in Muppet Treasure Island (1996). It was during this same period that his dramatic acting career began to blossom. Taking on a leading role opposite Judi Dench in Mrs Brown (1997), Connolly was a revelation as Queen Victoria’s brusque and exuberant adviser John Brown. He was subsequently nominated for a Leading Actor BAFTA, then again for Light Entertainment Performance at the British Academy Television Awards for 30 Years Of Billy Connolly (1998). With the movie offers then flowing in, Connolly concentrated on his dramatic work. He enjoyed an extremely busy on-screen period in the five years following Mrs Brown, and proved to be a capable and versatile leading man in, among others, The Debt Collector (1999), Beautiful Joe (2000) and The Man Who Sued God (2001). Connolly was also presented with a BAFTA award in recognition of his body of work at a televised tribute in 2003. Since then Connolly has established himself as both a sought-after character actor and an accomplished voice performer, most recently evident in Pixar’s Brave (2012). He will next be seen in Dustin Hoffman’s directorial debut Quartet (2012), playing “a dirty old man, in the nicest imaginable way”, and also as the dwarf king Dain Ironfoot in Peter Jackson’s The Hobbit: An Unexpected Journey (2012). BAFTA Scotland has this year decided to bestow on Billy Connolly its highest honour, an Outstanding Contribution to Television and Film Award. He will be presented with the award at this Life in Pictures event, marking his return to his home town of Glasgow.